Bay View Guest House is perfectly located right on the seafront in the picturesque fishing village of Beer. Offering wonderful sea views and a high standard of bed and breakfast accommodation for a reasonable price, their family has welcomed guests to Bay View and Beer for over 50 years. Bay View Guest House aim to make your well deserved break a special one by providing a calm and comfortable place for you to relax and unwind. You will be looked after by their friendly and attentive local staff and can expect an excellent breakfast, a spotlessly clean room and, most important of all, a very warm welcome. 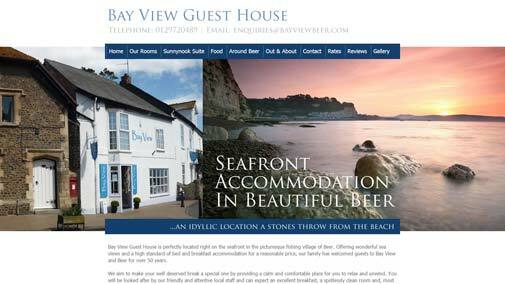 Bay View Guest House wanted a website with a theme that fits its coastal location, so a mixture of blues and whites were the perfect way to portray this. Including a rotating image which spans the width of the homepage is a great feature to showcase the views of the beautiful area of Beer.